Internet and the Web have revolutionized access to information. Today, one finds primarily on the Web, HTML (the standard for the Web) but also documents in pdf, doc, plain text as well as images, music and videos. The public Web is composed of billions of pages on millions of servers. It is a fantastic means of sharing information. It is very simple to use for humans. On the negative side, it is very inappropriate for accesses by software applications. This motivated the introduction of a semistructured data model, namely XML, that is well suited both for humans and machines. The present site aims to provide a consistent material to describe the structure of information found on the Web, and to explain how this information can be efficiently represented, described and accessed. 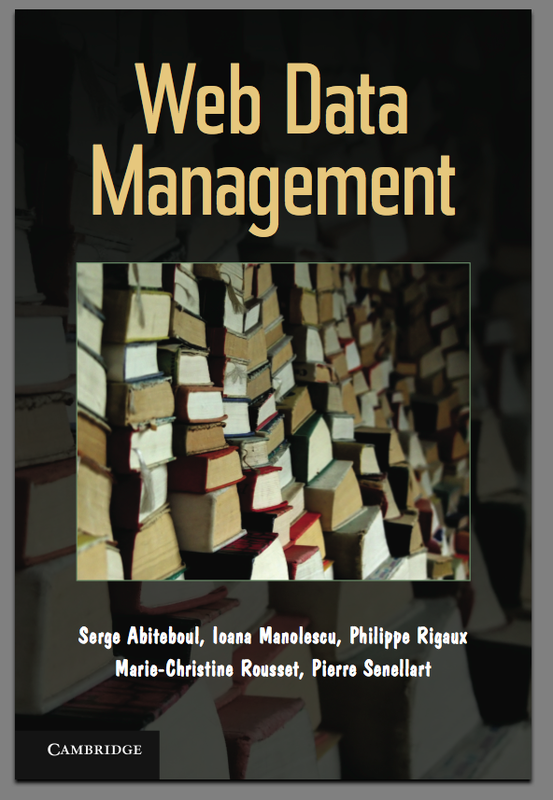 The primary audience are students interested in data management issues, and teachers who want to set-up a course on Web Data Modeling and large-scale data management in distributed and heterogeneous environments. You will find class material including slides, exercices, and documentation on the sofwares that can support practical learning sessions and projects. We also supply many examples of data, code and programs. You may take one copy of the book draft for personal use but not for distribution. Please do not post the draft on other web sites, instead, please put a link to this site. We are glad if our efforts contribute to the development and understanding of this emerging and exciting information management area. We appreciate if you inform us of any public use, and acknowledge this use to your audience.